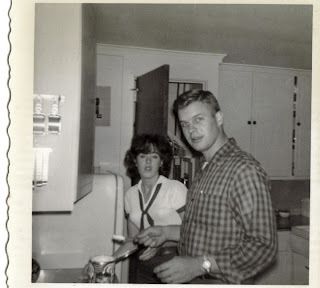 Blueberries and Dreams: My parents were hot. It makes me so happy to realize that they really loved each other or at least were so hot for each other that they got married and made babies. I mean I think I thought they were never really in love or that - I don't know - she got duped into marrying him somehow. Ha - not so much. Ahh I find human beings so interesting. And I really see the humans that they are now. Life is so hard and it hits some harder than others. Some people really play roles and manipulate, others do and don't. I don't know - I don't know anything except that I feel really blessed to understand where I come from. I feel really blessed to have been able to get to know my parents and move past my childhood. Okay or at least BEGIN to move past my childhood. I am definitely on the ship that is going past my childhood - main destination the present. Sooo anyway Larni is coming over so I have to go. He said something a little snippy to me on the train yesterday and I stood up for myself and then he called me later and said that that was so great that I did that. THAT is so much easier than letting it fester for 5 months right? That is a Taoist thing - "take care of the few before it becomes many." Byeeee Blueberry!! !